Filed in PAX East ‘10 wasn’t filled to the rafters with upcoming games like E3 is, but there were some pretty exciting games. While I could name such titles as Red Dead Renegade, Mafia II, or Civilization V the top prize, I prefer to go the surprise route when it comes to awarding a “Best of Show” award. Instead, I’ll go with Breach, a downloadable first person shooter coming to Xbox Live Arcade and PC. Breach is pretty much a game in the style of Battlefield 1943: map, squad, mission. All very basic. But where Breach is special is in the use of destructible environment. 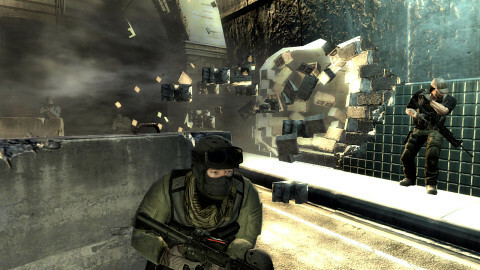 Using developer Atomic Games’ proprietary engine created for Six Days In Fallujah, Breach uses what the devs call “Active Cover”, a cover system similar to the sort that third person shooters employ, except most advanced. For one, anything can be used for cover, and the game procedurally determines the sort of cover an object provides. Holes and gaps created during the game will be new cover that the mechanic recognizes. With Active Cover, the player can attach instantly to cover, pop in and out of cover quickly, lean around corners safely, blind fire, and so on. However, the cover system might be considered an illusion. The game lives up to the name “Breach” in a big way. Whatever you use for cover can be blown away. Vehicles, sand bags, walls, doors, you name it. The game is a first person shooter, but will switch to third person when using cover. Part of the strategy is the rubberbanding between finding cover and removing your opponent’s. Some of it can be dramatic, such as using a grenade launcher on the supports of a building on the side of a cliff and causing it to shudder, break and tumble realistically into the ravine; the destruction physics are startlingly accurate. Aside from the special mechanics, the game features some standard but well-done gameplay that matches well with the Active Cover system. Games are 8-on-8 affairs, with an initial four classes to choose from: Rifleman, Sniper, Gunner and Support. As one might expect, each class has their own weapon loadouts, though the player has some customization before a match starts. 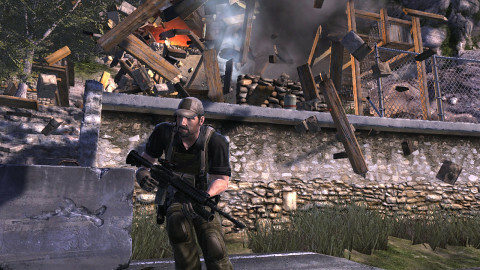 As with games like Modern Warfare 2 and Bad Company 2, players earn experience for kills and mission accomplishments, and when a player masters two classes, it unlocks a fifth class, Recon, which is a fast, low-armored class similar to the Scout in Team Fortress 2. All in all, there are twenty-three weapons – including rifles, handguns, grenades, knives, and rocket-propelled grenade launchers – all of which can be modified with eight different kinds of attachments, like silencers and scopes. You can even append a grenade launcher onto some weapons. Bionic Ear: Helps locate opponents through walls and ceilings. Sniper Detector: Amplifies light reflected off of scopes so the player can locate snipers even at long distances. Remote Motion Sensor: Manually placed in strategic locations across the map to protect a player’s flanks while they’re sniping. As for the game types, Atomic Games was cagey about what would be included in the final product – the demo they were running for gamers was strict team deathmatch. One can probably expect some variation of Capture the Flag, and the game seems perfect for a King of the Hill scenario. Expect Breach on the PC and Xbox Live Arcade sometime this coming Summer.